The free-standing Villa Maria Mercedes is surrounded by juniper bushes, olive trees and lush Bougainvillea. A patio, a pergola and a covered terrace offer guests bountiful places to relax in the fresh open air. 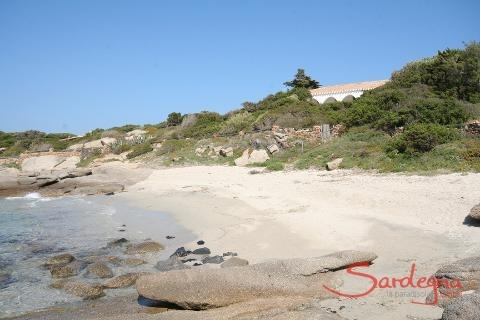 A short walk through juniper and macchia shrubs leads you directly to a beautiful beach. In the distance, the shimmering blue silhouette of unspoiled hill ridges spreads across the southern part of the island. Villa Maria Mercedes lies in the middle of a breathtaking landscape composed of sand dunes, fjords and unique cliff formations. Because of its exceptional location upon the slope of a hill, the house has a fantastic view of the dunes of Campulongu and the imposing southern coast. Embedded within the pristine environment of olive trees and Sardinian macchia shrubbery, the villa is an ideal refuge for nature lovers. Whether you are lounging in the shade of the outdoor terrace with its magnificent view of the sea or relaxing under the cover of the pergola in the wind-protected, inner courtyard, you will never tire of the bewitching interplay of light and shadow. The turquoise blue sea, visible beyond the dark evergreen of the bushes and the electric red of the Bougainvillea beguile the senses. Silence can be truly enjoyed here under the clear, starry skies of a summer night. Villa Maria Mercedes is owned by a Sardinian family and belongs to a group of villas which are used exclusively by residents only. The free-standing house has approximately one hundred fifty square meters of living space. The lovingly furnished outdoor area includes the covered terrace with a wooden table that can seat eight people and a patio with a seating area around the barbecue made of classic granite stone. 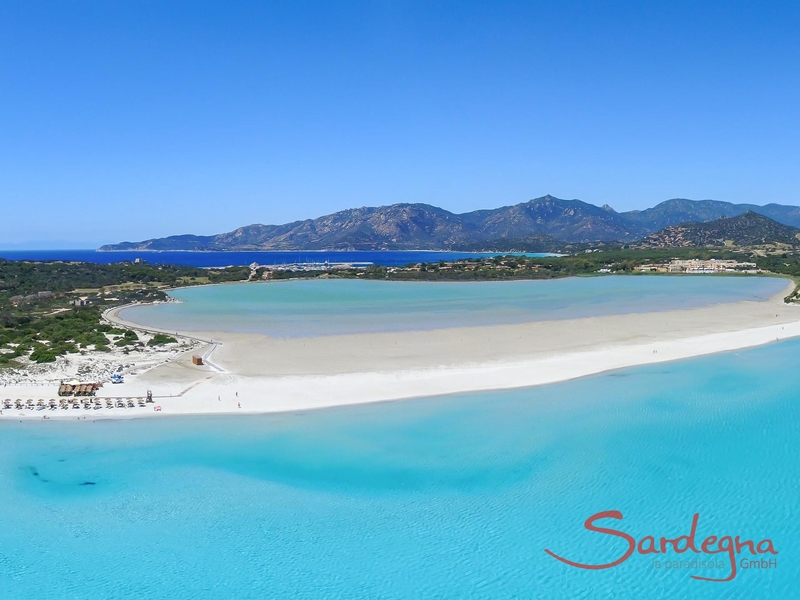 A typical modern Sardinian style with characteristic wooden beams, ceramic floor and details from granite stone give the interior a truly Sardinian flair. Villa Mercedes has four bedrooms (one spacious double room, two smaller bedrooms with single beds), three bathrooms and a beautiful living room with sitting and eating areas. A cozy indoor fireplace highlights the living space. The kitchen is outfitted with all the necessary electric appliances. The villa has air conditioning and electric heating. In the garden you will find a hot water exterior shower. Enjoy the video of Villa Maria Mercedes as well as the beaches of Villasimius. A supermarket and two restaurants are reachable on foot. Additional shopping possibilities, a traditional Sardinian weekly market and a large selection of first-class restaurants are only five minutes away by car in the picturesque <?xml:namespace prefix = st1 />village of Villasimius. 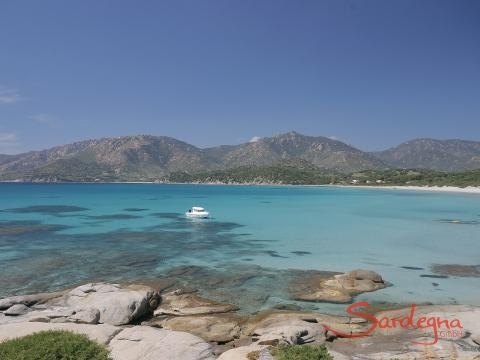 Daily excursions to the islands of Serpentara and Molinara set out from a nearby harbor, reachable on foot. 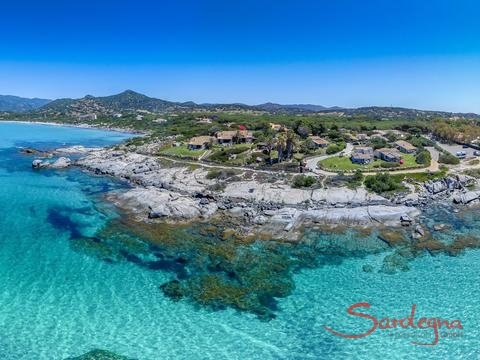 Villa Maria Mercedes – a beautiful beachfront homeThe free-standing Villa Maria Mercedes is surrounded by juniper bushes, olive trees and lush Bougainvillea. A patio, a pergola and a covered terrace offer guests bountiful places to relax in the fresh open air. 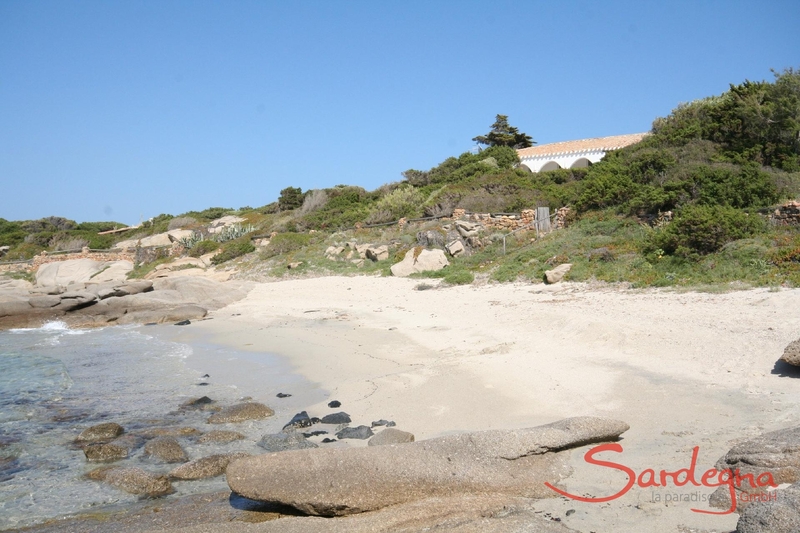 A short walk through juniper and macchia shrubs leads you directly to a beautiful beach. 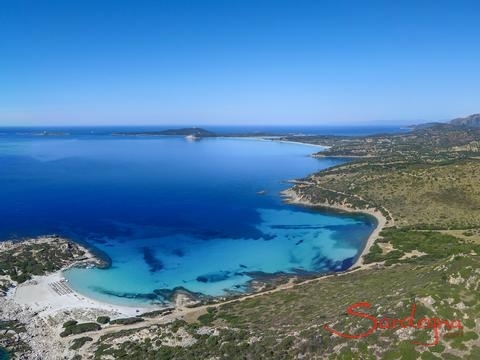 In the distance, the shimmering blue silhouette of unspoiled hill ridges spreads across the southern part of the island. A house of dreamsVilla Maria Mercedes lies in the middle of a breathtaking landscape composed of sand dunes, fjords and unique cliff formations. Because of its exceptional location upon the slope of a hill, the house has a fantastic view of the dunes of Campulongu and the imposing southern coast. Embedded within the pristine environment of olive trees and Sardinian macchia shrubbery, the villa is an ideal refuge for nature lovers. Whether you are lounging in the shade of the outdoor terrace with its magnificent view of the sea or relaxing under the cover of the pergola in the wind-protected, inner courtyard, you will never tire of the bewitching interplay of light and shadow. The turquoise blue sea, visible beyond the dark evergreen of the bushes and the electric red of the Bougainvillea beguile the senses. 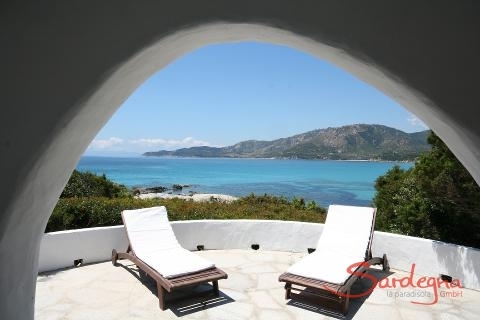 Silence can be truly enjoyed here under the clear, starry skies of a summer night.Villa Maria Mercedes is owned by a Sardinian family and belongs to a group of villas which are used exclusively by residents only. The free-standing house has approximately one hundred fifty square meters of living space. The lovingly furnished outdoor area includes the covered terrace with a wooden table that can seat eight people and a patio with a seating area around the barbecue made of classic granite stone. 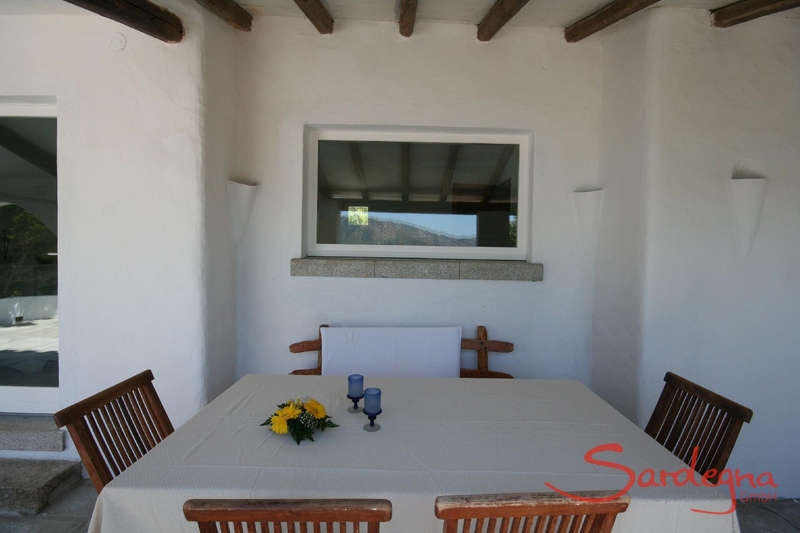 A typical modern Sardinian style with characteristic wooden beams, ceramic floor and details from granite stone give the interior a truly Sardinian flair.Villa Mercedes has four bedrooms (one spacious double room, two smaller bedrooms with single beds), three bathrooms and a beautiful living room with sitting and eating areas. A cozy indoor fireplace highlights the living space. The kitchen is outfitted with all the necessary electric appliances. The villa has air conditioning and electric heating. 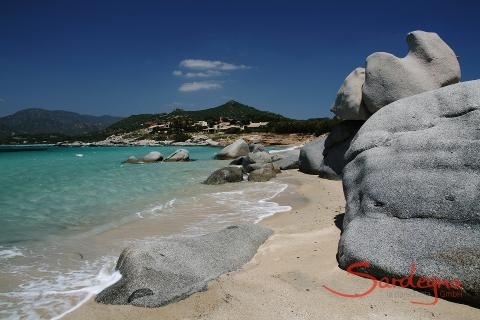 In the garden you will find a hot water exterior shower.Enjoy the video of Villa Maria Mercedes as well as the beaches of Villasimius.In the areaA supermarket and two restaurants are reachable on foot. 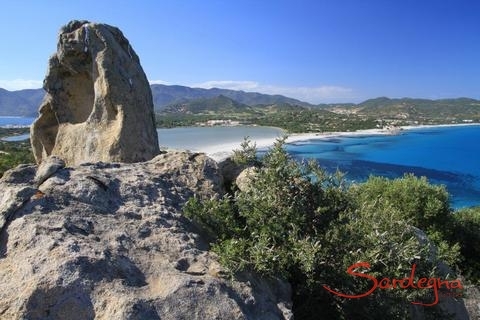 Additional shopping possibilities, a traditional Sardinian weekly market and a large selection of first-class restaurants are only five minutes away by car in the picturesque village of Villasimius. Daily excursions to the islands of Serpentara and Molinara set out from a nearby harbor, reachable on foot.